As a 17-year-old, I find it a challenge to be excited by a lot of things. Two of these things certainly; getting up early on a Monday morning, and carbon steel vessels full of compressed air. 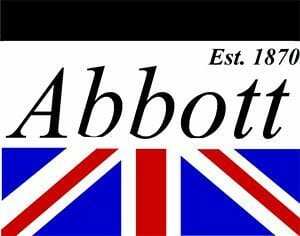 Yet there I was, getting up early on a Monday morning, to begin a week of work experience at Abbotts, a manufacturer of carbon steel vessels to be filled with compressed air. My sense of post-exam euphoria had been shattered by a week back at school, and now here I was dragging my sleep-deprived backside onto a train and into Newark. I’ll be honest with you, at this point I really couldn’t be bothered. It was basically Summer, and as a teenage lad, my brain had already gone into full shutdown. I guessed I should stay open-minded however – even if I didn’t enjoy my time here, I could always (as one teacher, Mrs Lyons, put it) “fake it till I make it” (roll-on Saturday!). So, with that thought in the back of my head, I entered the office. 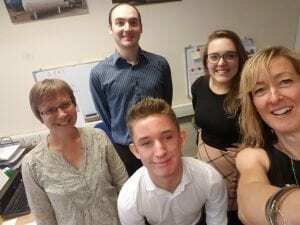 Initially, I was introduced to the Sales Team, comprising some new faces – Sharon C, Elliott, Abbie – as well as a familiar one, Heather, who I already knew from the 17 years of providing me with food, a bed, lifts (anytime, anywhere!) and waking me up every morning with that flippin’ hair dryer. Next – as it was put to me – ‘the lad’s office’ – Mark and Richard. After a brief chat regarding the frequency girls my age use the term ‘like’ out of context, (in which some very convincing points were made), I met Sharon B and Cynthia (the official office multi-tasker), and finally Jason, production supervisor in the factory, and his team; Phil, Dennis, Geoff, Aidan, Terry, Terry, oh and Terry (obviously a popular name in the early 1960’s), Billy, Mick, Gordon, Shaun, Keith, Nick, Callum, Alex, Luke, Tony, Alex, Charlie, Dan, Chris, Tony, Nigel, Chris, Josh, Darren, Martin, Luke, Tyrone, and Simon (breathe). First up on the agenda for Monday was the weekly Production Meeting, where I was to observe as an outsider to the whole process. It came across as prompt and efficient, but also not as ‘official’ as I’d imagined. To an extent it seemed rather informal, which I preferred, as it made the whole thing a lot easier to integrate in to. I especially approved of Jason’s contributions – both the one about workforce capacity in the factory, which he also took the time to explain to me, and the one about getting Netflix, because everyone else has it Mum. Come on. 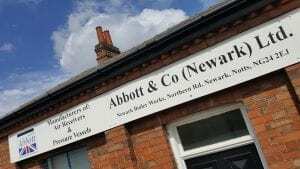 I was then given a brief demonstration of the bespoke IT system Abbotts uses to make the ‘customer enquiry to drawing to production to delivery’ process a lot more efficient – which was partly designed by Henry, the Managing Director at Abbotts. Tuesday – basically Monday, but a little bit closer to Friday. I wasn’t ecstatic about getting up early then either, but at least I knew what to expect from Abbotts – a friendly, chilled atmosphere. I was given a more in-depth walkthrough of the IT system by Elliott, who explained to me how the sales team take an initial enquiry in the form of an e-mail or phone call and note down all the relevant specifications. 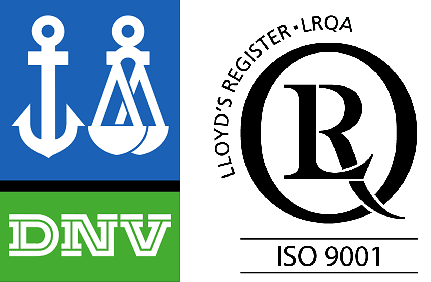 Apparently, each vessel is built to a design code such as PD5500, ASME, EN13445 and BS5169 – who, I believe, narrowly missed out on the Star Wars gig to R2-D2 – and turn it into a quotation for the customer. 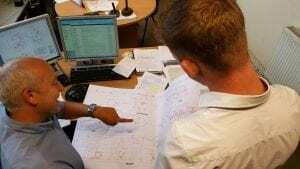 If this results in an order, these are presented in a form that the Design Office can use to come up with a drawing which is then sent to the customer for approval. Once approved, parts are ordered and it’s up to the team in the factory to make it. I spent Wednesday morning with Mark in the Design Office. Or I was supposed to. I actually spent Wednesday morning with Mark in the factory, as he, Richard (Purchasing) and Jason attempted to figure out how a certain piece (free-issued by the customer) fit in a vessel in order to carry out a certain external test. As an outsider, this struck me as slightly odd, because Mark and Richard are located in the office. However it also made clearer to me the ‘community vibe’ within Abbotts. Everyone knows everyone in a fairly large business, and from what I’ve witnessed everyone is ready and willing to help each other out with any issues that may arise. The guys from the office are not afraid to get their hands dirty, and are happy to offer up any expertise they may possess (for example, Mark designs the vessels, and so has a greater grasp on how these things should operate). 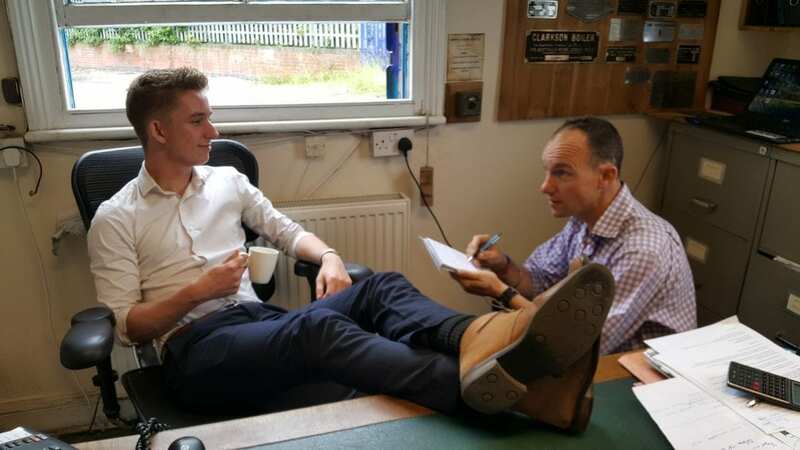 That afternoon, I had set aside some time to talk to Henry, the Managing Director, about his job, and to ask him some questions that school had set for me. One thing that was blatant from his responses was how passionate he is about what he does. He made clear that looking after the workforce is essential, and that if you do, the workforce will be in the best state to complete their jobs to the best of their ability. He also made clear that as a firm, he does not shy away from the fact that Abbotts is there to make a profit, which seemed strange to me, as in my experience most companies tend to be delicate about this and try to hide it. The best way to make this profit I was told however, is to provide the best possible service for your customer – if you are likeable and helpful, people are much more willing to help you out when it comes round full circle. Just like you can help me by checking out next week’s instalment of my blog…. 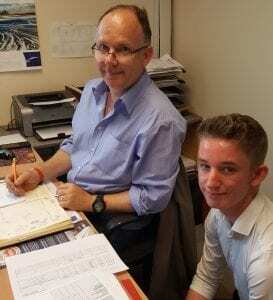 As part of our programme working with local schools, we are hosting Joe – a student at the Minster School, Southwell – for his week of Work Experience.